Betway is a bookmaker gaining plenty of positive feedback at present from punters around the world. 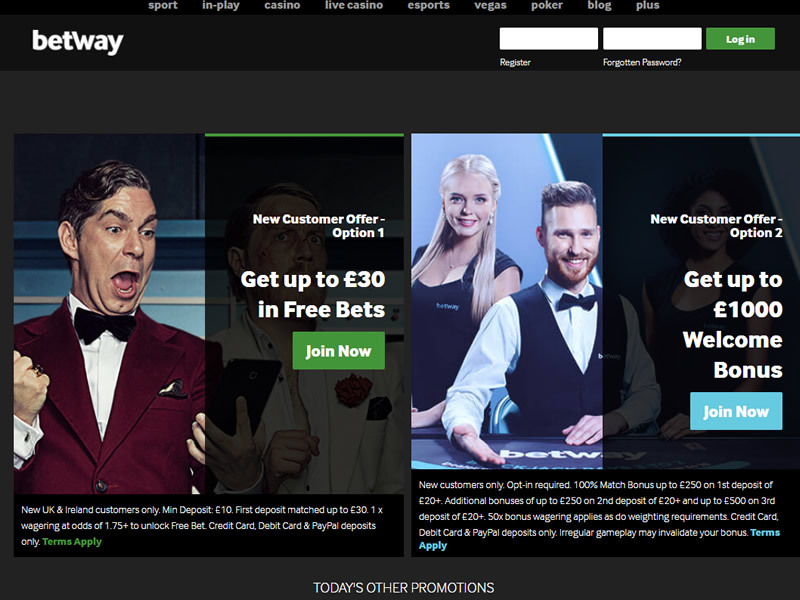 If you’re a punter looking for competitive betting odds and regular specials you’ll love Betway. With over 30,000 markets available Betway continue to be a popular choice among punters in the UK and across the planet. £10 in Free Bets every week. When you place £25 worth of football multiples. Opt in required. 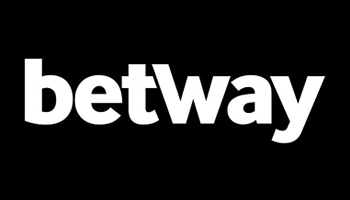 Betway are one of the newer players in the online betting market, as they were started just back in 2006. However, they were started a bunch of sports fans who wanted to get together and offer something a little different for punters; a way to bet how they liked and wherever they liked. Ok I don’t blame you Betway was one of those sites who had several years under their belt, but not all those years are good ones. They started 10+ years ago on shaky ground. They had loads of complaints. They made a few blacklists. You know, things that few gambling sites come from, however Betway seem to have turned the corner. So, they have bombarded punters with betting options that won’t leave customers short at all of getting bets down. The opportunities are vast there and have grown to be a prominent sponsor of sports as well, backing the Premier League Darts and being the principal sponsors of Premier League club West Ham. Those who are interested in large amounts of markets will be right at home with Betway. They have odds on pretty much every sport and event imaginable. There is little that isn’t available. For major sports, there are often a dozen or more markets per each match. In-play betting is an area where Betway truly stands out. 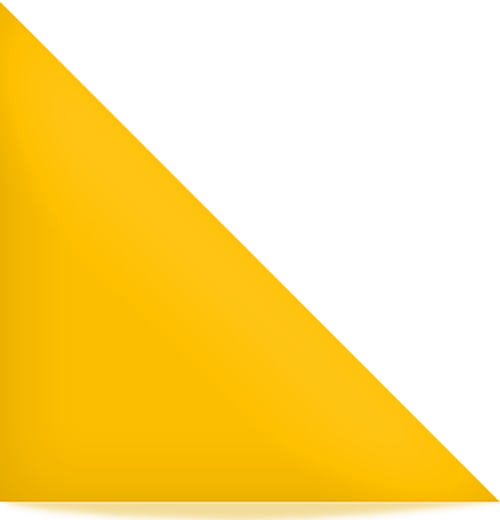 Their live betting menu and software is some of the best online. 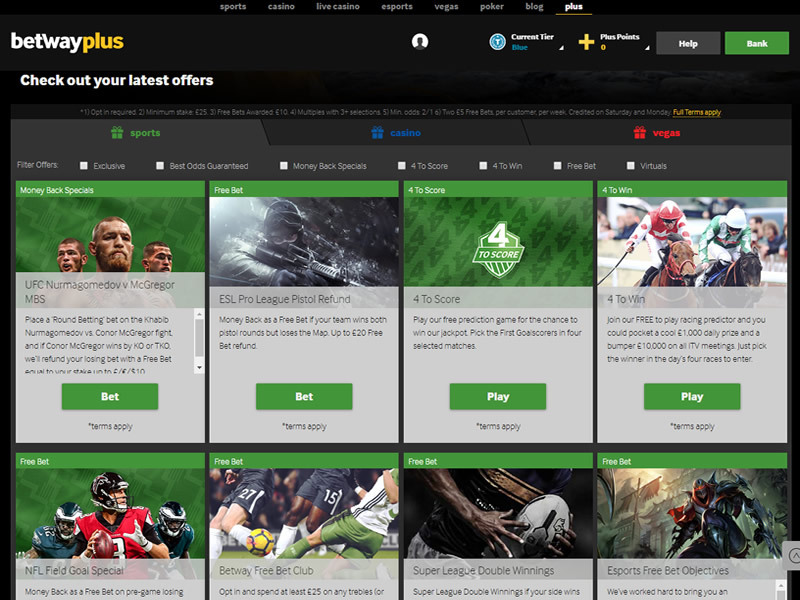 Players will be able to bet more pre-match markets, but every one of the sports they offer has at least a few live betting markets. With its software provided by Micro-gaming, members are also assured of the quality of Betway’s live betting service. 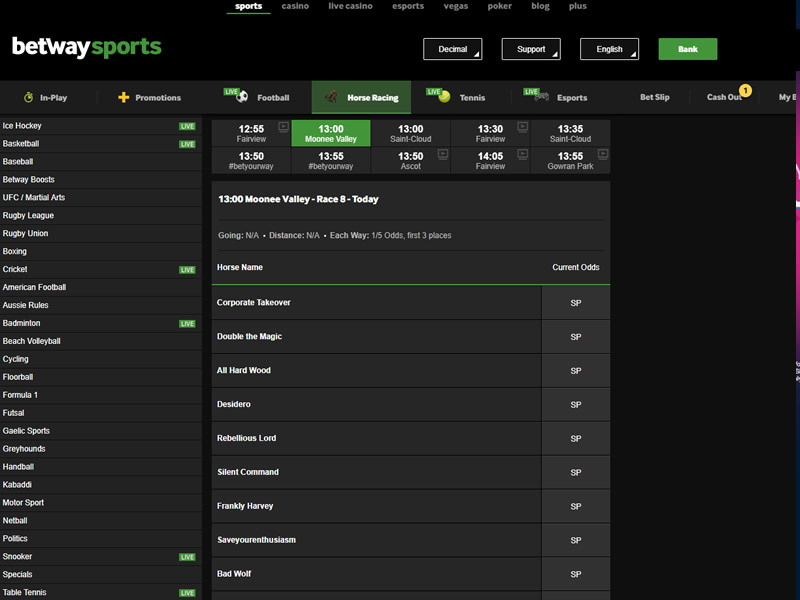 The design of Betway.com is good, but it’s no way near as polished as their mobile betting platform. Our main gripe is that it takes more clicks to find the betting market that you want to compare odds for than it does at the other online bookmakers we feature. You probably won’t need to but should you for some reason need to contact the Betway customer support team they can be reached by either email, telephone, post or online. Join Betway and get a £30 bonus! New UK & Ireland customers only. Min Deposit: £10. First Deposit matched up to £30. 1 x wagering at odds of 1.75+ to unlock Free Bet. 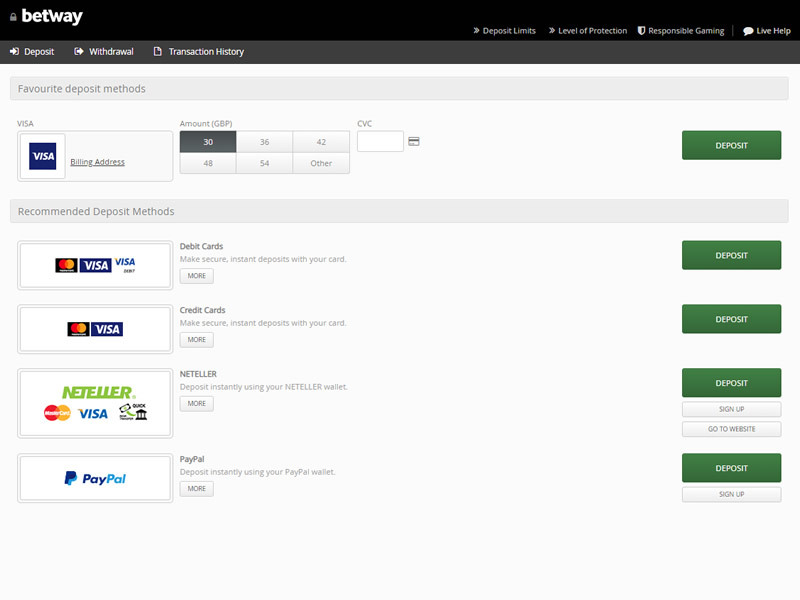 Credit Card, Debit Card & Paypal deposits only. Further T&Cs Apply.